TORONTO, ON – Goose Island Beer Co. has announced that its annual Black Friday event will once again be migrating north of the border, with the 2017 vintage of Bourbon County Brand Stout (14.1% abv) set to be available at two locations in Toronto. Brewed in honour of the 1000th batch at our original Clybourn brewpub. A liquid as dark and dense as a black hole with thick foam the color of a bourbon barrel. The nose is an intense mix of charred oak, chocolate, vanilla, caramel and smoke. One sip has more flavor than your average case of beer. A limited amount of BCS 2017 will go on sale at the LCBO Pop-Up Shop (600 King St. W., Toronto) starting at 9:30 AM, retailing for $24.99 per 500 ml bottle. Bernard Priest-Blais, head brewer at Goose Island Brewhouse Toronto, and Afrim Pristine, co-owner of The Cheese Boutique, will be on hand to serve coffee and cheese samples to waiting customers. The beer will also be available to taste at a ticketed event taking place from 5:00 to 6:00 PM at the Goose Island Brewhouse (70 The Esplanade, Toronto). The $20 admission includes a 10-ounce pour of BCS 2017, served in a limited edition BCS tulip glass that can be taken home. BCS t-shirts, a specially curated beer flight, and a paired charcuterie board will also be available to purchase, and any BCS remaining after the ticketed event will be available to the general public while supplies last. 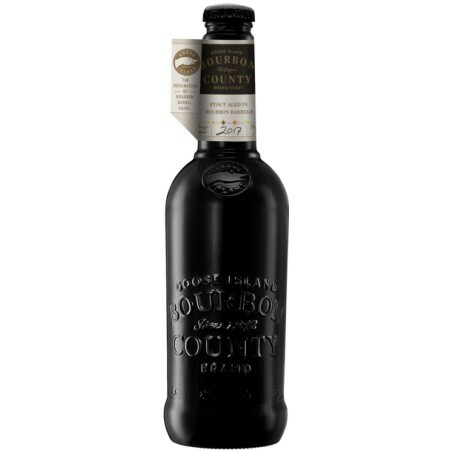 For more details and to reserve a ticket to the Bourbon County Brand Stout tasting event, see the Eventbrite listing.